At first sight, Jacques Laffite may seem a strange choice to focus on for the Austrian Grand Prix. However, one look into his performances and you know there must be something interesting there. With four podium finishes in the Mid-European country, the Frenchman ties for the record with Nelson Piquet. It started back in 1974, when Laffite came to Austria two weeks after having made his debut on the Nurburgring. In between, the Frenchman was also driving in Formula Two, eventually ending up third in that championship, behind Patrick Depailler and Hans-Joachim Stuck. Up until Laffite joined the team, Frank Williams's team had had no less than three drivers in the second car during the seven races they ran. When Laffite joined, stability was finally found and the season was finished with him and first driver Arturo Merzario. In terms of performance, little was to be expected of the team, which was then known as ISO-Marlboro. At the start of the season, sole driver Arturo Merzario had put in some impressive qualifying performances, resulting in a single championship point in South Africa, but as often happens the performances went away as the big teams gained their advantage through development during the season. As the season continued, Merzario had to settle for a qualifying position in the second half of the grid, while the second car rarely made it onto the grid at all. Imagine then the team's surprise after qualifying for the Austrian Grand Prix, when the ISOs showed up ninth and twelfth on the grid, Merzario beating Laffite. Whether or not the drivers had given too much in qualifying remains unclear, but once the race got underway, it was disaster from start to finish. Laffite immediately dropped down the order all the way to the back with wheel problems, while his teammate initially got off to a good start, only to retire halfway through the race with fuel pressure trouble. Laffite, however, continued to struggle on, many laps behind the leaders. The Frenchman eventually saw the checkered flag but wasn't classified as he was no less than 13 laps behind. The experience counted though, for himself as well as for the team. The 1975 season proved to be just as bad for the team. Without the Marlboro backing, the team was now simply called Williams. The driver line-up was even more chaotic than the year before. Throughout the year, Laffite had Arturo Merzario, Ian Scheckter, Francois Migault, Ian Ashley, Jo Vonlanthen, Renzo Zorzi and Lella Lombardi as teammates, with Tony Brise and Damien Magee also making appearances in the Williams. With no structured development taking place, Laffite's second place in Germany came as a huge surprise, even though it only happened because half the field retired ahead of him. As the team arrived in Austria two weeks later, the morale had been boosted. In qualifying, this only improved as Laffite put the car 12th on the grid, the team's best position since Merzario qualified 11th in Brazil, the second race of the season. The race, however, was nothing to write home about. The Williams behaved like the mediocre car that it was, and Laffite was unable to move it up the order, eventually ending his race after 21 of the 29 laps. 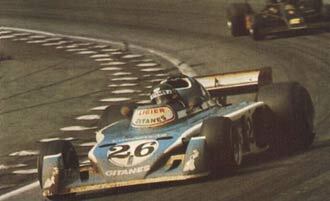 For 1976, Laffite moved to the newly founded Ligier team, after having clearly beaten the team's 38 year old development driver Jean-Pierre Beltoise in a November test at Paul Ricard. The combination worked well, resulting in a fourth place at Long Beach, followed by a third place at Zolder and another fourth at Anderstorp. Jacques largely benefitted from the fact that this was just a one car operation, meaning the team could concentrate on him only. In Austria that resulted in the best weekend of the year. Laffite was fast right from the outset and turned in the fifth fastest time in the first qualifying session. Then it started to rain, which didn't stop until Sunday morning. Thus, Laffite found himself fifth on the grid, on a drying circuit, as the race took off. For once the start didn't cause total chaos, as everyone got off their position just fine. Laffite was passed at the start by Tom Pryce but he was quickly back in fifth, when the Shadow driver dropped back with mechanical problems. However, a lap later the Frenchman found himself passed by both the storming Tyrrell six-wheeler of Jody Scheckter and Jochen Mass's McLaren. Whereas Scheckter quickly disappeared into the distance, Laffite and Mass remained close to each other with the Ligier driver moving back ahead of the McLaren pilot again after ten laps. Four laps later, Laffite was once again back in fifth, when Jody Scheckter crashed his Tyrrell and retired. The Frenchman eventually caught up with McLaren driver James Hunt and Lotus driver Ronnie Peterson. What followed was a short but intense duel between three cars. In the end Laffite moved ahead of the other two and set his sight on the other Lotus of Gunnar Nilsson ahead of him. With nine laps to go, he achieved his goal and moved into second, with Nilsson and Hunt hot on his tail. By then John Watson in the Penske was too far ahead, but Laffite successfully continued to fend off his followers and brought home a well earned second place. The next year, Laffite put the Ligier sixth on the grid. Considering the amount of problems earlier in the season, this was a decent result. However, the race once again was dramatic, just like in 1974. At the start Laffite dropped down to 11th place, after which he quickly dropped further and further until he retired from last place after 20 laps, when the Ligier suffered a severe oil leak. In 1978, Laffite's breakthrough was finally there. The Ligier was now one of the most reliable cars on the grid and became faster and faster as the season progressed. By the time the circus arrived at Austria, a top eight qualifying performance was not out of the ordinary for the French team, still competing with Laffite as its only driver. Therefore, it came as no surprise when the white and blue machine was fifth on the grid. However, as had happened often before, the race was a completely different game. With dark clouds above the circuit, the drivers got off the grid. Laffite was soon passed by his best friend Jean-Pierre Jabouille in the Renault, as well as by Brabham ace Niki Lauda. After just four laps the sky opened and rain fell down aplenty. The race immediately turned into total chaos, with Scheckter's Wolf and Nelson Piquet's McLaren becoming the first victims. Laffite stayed out of trouble and when the race was red flagged after six laps, he was up in fourth place. The race was then restarted in the finishing order of the first part. For Jacques Laffite the race appeared to be over soon after as he dropped back to the rear of the field after only two laps when he pitted for slicks. For a long time this appeared to have been too early, but in the end the Frenchman went home with two points. For 1979, Laffite wasn't the only horse in Guy Ligier's stable. He now had an experienced teammate in the form of ex-Tyrrell driver Patrick Depailler, until a hang-gliding accident sidelined Depailler for the second half of the season. His place was then taken by the old, but even more experienced Jackie Ickx, who was Laffite's teammate in the Austrian Grand Prix. Nevertheless, the Belgian proved no match for Laffite, who was fighting the Ferraris of Scheckter and Villeneuve for the championship. Qualifying was a disappointment for Ligier, as their number one driver only managed eighth position, with his teammate back in 21st. Early in the race, Laffite battled with Pironi, Scheckter and Jabouille, and as the race settled down, he found himself in seventh place. After 16 laps the Ligier driver moved up a place when Jabouille's gearbox refused further service. While Alan Jones led comfortably, the second Williams of Clay Regazzoni had to cope with considerable pressure from Laffite. After 20 laps, the Ligier driver finally got past the Williams. The order only changed in the final laps of the race, when Rene Arnoux had to pit for fuel in order to make the finish at all. The Renault driver thus saw a second place go up in smoke, finishing sixth in the end. This put Laffite in a good fourth place, but there was more to come. The Frenchman quickly caught up with Ferrari's Jody Scheckter, who was having serious brake problems, and in the final lap the positions changed and Jacques Laffite was once again on the podium. The next year, Jacques entered his fifth year with Ligier. Instead of an old and experienced teammate, he was now partnered by the fast young talent of Didier Pironi. 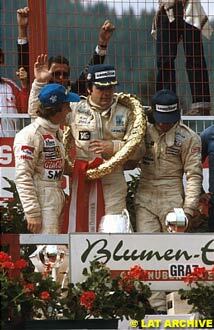 Podiums became a common thing and both drivers took a win, Pironi in Belgium and Laffite in Germany. With his win fresh in the bag, Laffite came to Austria full of hope and expectation. Again he qualified on the third row, fifth this time around, and again the start was less than wonderful. The Ligier driver dropped back to 12th, but quickly passed rookie Alain Prost and old fox Hector Rebaque on his way back to the top end of the field. Unfortunately, he had Gilles Villeneuve behind him and the lightning quick Ferrari driver soon made his way past Laffite. A couple of laps later it was the Ligier ahead of the Ferrari again and after Pironi's car started to develop problems, Laffite found himself in eighth, behind Elio de Angelis, the Lotus driver. This lasted for a mere three laps, after which Laffite passed the black and gold car and went charging towards his next victim. At first the Frenchman was behind Alfa Romeo driver Bruno Giacomelli, but when the Italian retired he was faced with the task of trying to catch Nelson Piquet's Brabham. Meanwhile, race leader Alan Jones had to pit and eventually settle for a pointless finish, moving Laffite up yet another place. Just before three quarter distance, Laffite finally caught up and got by Piquet, and that was that: the Ligier driver finished third, just behind countryman Rene Arnoux. In 1981, the Ligier was much less reliable, but when it finished it was more often than not on the podium. Austria was no exception and qualifying went even better than usual. Laffite now qualified fourth on the grid, a good prospect for the race. As the race started, it was as usual Gilles Villeneuve who rocketed into the lead, followed by Prost, Arnoux and Villeneuve's teammate Didier Pironi. The latter had an even better start than his teammate, coming from eighth on the grid. Laffite thus dropped one place and came around in fifth after one lap. As had happened quite a few times before, Villeneuve's lead didn't last long. In the third lap, the Canadian was a little too enthusiastic and slid off the track. He resumed in sixth, but Laffite was now ahead of him. The Ligier driver was now involved in a fierce duel with Nelson Piquet, as the two approached the Ferrari of Pironi, which was starting to suffer from its Michelin tyres. Laffite successfully fended off both drivers and grabbed third behind the Renaults of Alain Prost and Rene Arnoux. Halfway through the race, Prost's suspension failed and the leader was sent off the track to retire. A train of Arnoux, Laffite, Piquet and Jones now ran around the track in that order. 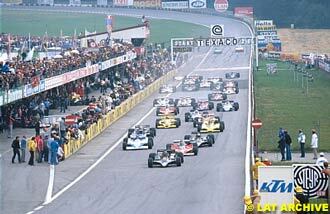 The only change came on lap 39, when Jacques Laffite made his way past Arnoux and into the lead. During the remaining laps, the Ligier driver held his followers behind him and as the flag dropped, he got his fifth career win and his first in Austria. The next year, Laffite was still at Ligier, now with Eddie Cheever as his teammate. As the season progressed, it became clear that the good years were behind Ligier for now. Usually neither driver qualified in the top ten and in Holland Cheever didn't even qualify for the race. In this rather hopeless situation, the 14th place on the grid in Austria wasn't even that bad for Laffite. However, once again the race proved to be the total opposite of qualifying for the Frenchman. While the usual start line chaos of Austria erupted around him, Jacques kept his head cool and stayed out of trouble. The result was tenth position after just two laps. Lady Luck didn't turn her back on Laffite just yet, and after six laps he made his way past Nigel Mansell, who was having trouble with a misfiring engine. Another lap later, both Teo Fabi and Derek Warwick retired with mechanical problems and all of a sudden Laffite was in seventh place. The next to retire ahead of Jacques was his countryman Rene Arnoux, whose Renault turbo failed to cooperate. Laffite then concentrated on holding position, knowing the Brabhams ahead of him might eventually fall victim again to the engine problems which had plagued them lately. As the race passed the 30 lap mark, that was exactly what happened and as an added bonus, young charger Brian Henton in the Tyrrell disappeared from behind Laffite. The Ligier driver at this point had more in hand than he had ever dared to dream of. Then, with less than ten laps to go, leader Alain Prost grind to a halt: broken fuel injection put an end to his race, and so Elio de Angelis and Keke Rosberg were left dodging and diving for the win. For Jacques Laffite it didn't matter who won, his day was a success already; he finished third and scored his only podium of the year. For 1983, Laffite left Ligier after seven years of service. His new team was Williams, where he drove alongside World Champion Keke Rosberg. This year saw a continuation of the downward spiral of Laffite's career. His results weren't getting any better and Williams was also on its way down. This spiral found new depths in Austria, where Laffite qualified 24th, the worst of his career. Once again his cool head kept him out of trouble at the start. Jacques drove a steady race and when all settled down, he was in fifteenth place. This time, however, Lady Luck wasn't with him. The Williams developed some vibrations and when things got worse, Laffite was left no choice but to retire just before half distance. The partnership with Williams and Rosberg continued into 1984. The results were slightly better this year, but the reliability issue wasn't improving. Only in the soaking heat of Dallas the coolness of the Williams drivers brought them first and fourth, with Rosberg taking the victory. Coming to Austria, however, Dallas was long forgotten. After having qualified 11th, Laffite dropped back to 14th at the start and slowly climbed back up again only to see his engine go up in smoke, while in tenth place. When Williams signed Nigel Mansell to bring them back to the top, Jacques Laffite's days at the team were over. Once again he moved to his old love, Ligier. This year he was teamed up with accident-prone Italian Andrea de Cesaris. Qualifying outside the top ten was by now a given for Laffite and Austria was no exception. With a 15th position, the only real satisfaction came from beating his teammate. During the race he slowly moved up the order, mainly through cars retiring ahead of him. After three quarter distance, Laffite was even seventh for a short while, but it wasn't meant to be. A broken wheel sent the Frenchman into the barriers and his race is over. Even though Laffite was 42 years old by now, he didn't want to think about stopping. For 1986 he stayed with his Ligier 'family'. His new teammate was another old rival, Rene Arnoux. 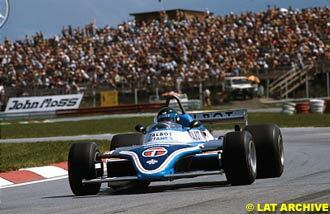 However, the Austrian Grand Prix didn't get another visit from Jacques Laffite. After a horrendous crash in the British Grand Prix, his Formula One career was over. But it left him with the tally of twelve visits to Austria which amounted to four podiums and a win. To date, he remains one of the most successful drivers in the Styrian mountains.